Bees have existed for millions of years. In relative terms, it’s only over the last “second” that we humans have been involved, first to harvest honey without regard for bees (obliterating the colony) and, more recently, with man-made structures we call bee hives. While bees face many threats, as we will see in Course 3: A Healthy Beehive, they do well for themselves with or without our help. So it’s interesting to contemplate just how much we help bees when we place them in a hive. While there is a deeper philosophical question, let’s consider the bee and the beekeeper and how they can co-exist. Much of this comes down to attitude and your motivations as a beekeeper. PerfectBee believes there is a simple truth that, if you keep it in mind, will serve both the bees and you very well : everything you do as a beekeeper should be for and with the welfare of your bees in mind. As you approach beekeeping, as you select and purchase your beehive, install your bees, carry out inspections and even harvest honey – if you think in terms of your bees first, you will increase your chances of success. So what does that mean in reality? In short, it means understanding what your bees need. If you grasp this then you are well-prepared. With that in mind, here are the main factors you need to consider. Bees are known for their willingness and ability to set up home in the strangest of places. In nature, they will find a suitably-sized and oriented space, with a hollowed out tree being a common example. There is a certain sweet spot for the volume the space chosen, with around 50 litres being a common size. Spaces that are less than 10 liters or greater than 100 are generally avoided. Having located their spot, they will start building comb, in a perfectly natural way. When we install a hive we try to mimic that environment, with boxes, frames, foundation and more. The way we hang frames in a beehive merely emulates the way bees create hanging, parallel honeycombs in nature, with bee space between each one. The bees will use the comb in a particular pattern. The upper part of the comb (remember, it hangs vertically) is used to store honey. The lower part is used for pollen and brood. How often should beekeepers help their bees? From a beekeepers perspective, we provide the hive and the frames. Many beekeepers also provide the foundation. Bees are incredibly resourceful and will forage for miles if necessary. This is one reason why honey certified as organic commands a considerable premium. The surrounding areas have to be free of pesticides and there are very few places in the US where this is the case. Beyond availability, the timing of the blooming of flowers is also an important factor. If the reachable flowers tend to bloom at similar times of the year, then the honey flow will be compressed. It is therefore preferable for flowers to be blooming sequentially through the spring, summer and fall, offering bees a longer time-frame in which to collect pollen and nectar. From a beekeeper’s perspective, nature doesn’t always lend a helping hand here, but as beekeepers we have the option to proactively and intentionally plant flowers that bloom at different times of the year. In addition to a place for brood, pollen and nectar/honey, bees need a ready source of water to hydrate the hive. By the way, they are not particular! In fact, they seem to have a preference for somewhat dirty water. 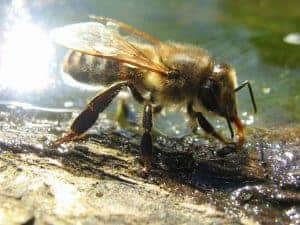 How important is it to have water near your hive? Providing a source of water is generally easy to accommodate and will keep your bees from needing to venture afar for water. Despite wanting water, bees don’t need TOO much water! This can be a factor in two ways. From a beekeeper’s perspective, hive designs allow for rain but there are some scenarios where slanting the hive very slightly is justified. There are various equipment choices, such as the very popular Langstroth Insulation Box, that can help manage moisture. Somewhat competing with the need to keep rain out, is the need to support a reasonable flow of ventilation. Once again, bees are skilled at helping themselves here. In the summer bees will line up at the entrance of the hive and flap their wings furiously, to push around into the hive. Sometimes, a similar crew will exist on the other side of the hive, sucking air out! It’s a rather impressive show of teamwork. From a beekeeper’s perspective, modern hives have a design that supports bees in their need to ventilate the hive. In the winter, bees clearly have their work cut out. When the hive is surrounded by snow, for example, it’s clear that the bees need to maintain a large delta between the outside air temperature and the 92 degrees at which the queen is kept. Of course, the winter cluster is the answer, one of nature’s more remarkable solutions. 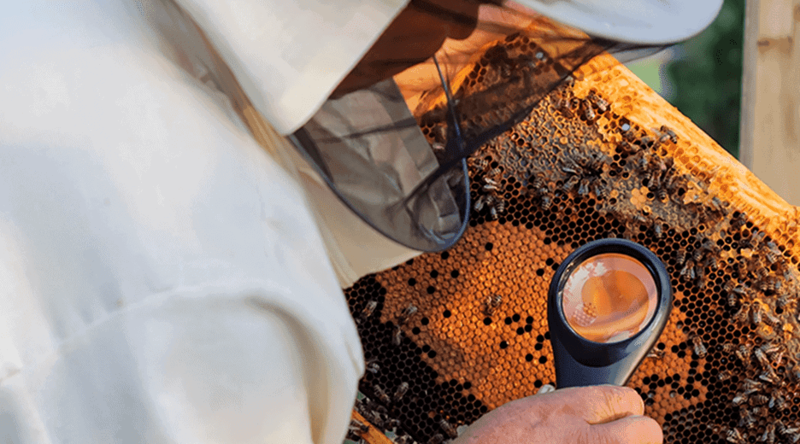 From a beekeeper’s perspective, although not needed in many areas of the country since temperatures do not fall sufficiently, hive wraps are available. This is a rarity though and, for the most part, if bees have sufficient honey resources to get them through the winter then we are best to leave them to their own devices. Bees don’t weigh much! A worker bee will be in the order of 0.1 grams. This might increase to perhaps 0.15 grams when she is full of honey. But regardless, that’s a small and light creature and one which a gust of wind can throw off track. Of course, bees won’t forage in high winds but even in moderate winds they are presented with a challenge. From a beekeeper’s perspective, it is sensible to place the hive in a wind break of some type. Bees seem to like the sun for various reasons, not least of which is that it sends a message that the day is suitable for foraging. On the other hand, they don’t want too much sun, baking the hive all day long. From a beekeeper’s perspective, finding a location that receives sun, but is eventually shaded later in the day, is a good balance. As you face decisions and challenges with your bees, always think back to what they need. We will cover the threats bees face in Course 3 : A Healthy Beehive. But the needs described above give you some insight into the basic environment in which your bees can survive.